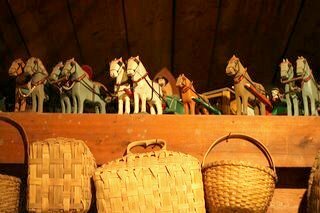 Lancaster County has some really interesting Amish stores where you can buy locally made arts & crafts, Amish furniture, folk art, Amish quilts, pottery, weather vanes, toys, clothing, Hex signs, and other items unique to Lancaster County. There are even some shops to purchases freshly baked goods for refreshment. The country and Amish stores recommended on this page are either owned and operated by Amish and Mennonite proprietors or simply specialize in authentic goods created by the Amish or Mennonite communities. In any case, it is quite an experience wandering through some of these old-fashioned Amish stores. It often feels as if you're walking back in time and soaking up the atmosphere of a different era. These country Shops and Amish Stores are listed by the town in which they are located. Please remember that most local shops, and especially the Amish stores, in the region are closed on Sundays. This refurbished barn is run by an Amish family. There are many quilts, wall, hangings, Amish dolls and crafts to choose from. Quilts, rugs, pillows. wall hangings, Amish dolls and much more. Many of the items are handmade by Amish and Mennonite women working out of their own homes sitting at their quilting frame. This country gas-lit store sells a wide variety of natural and health foods in the old Amish style. Over 200 handmade quilts as well as wall hangings, pillows, potholders and other crafts. You can even design your own quilt pattern. This Amish store located on the eastern border of Lancaster County specializes on some fantastic children's furniture and toys. Cradles, rockers, red wagons, rocking & hobby horses, clothes trees, swing sets, musical train penny banks are on display. This country store carries a wide variety of fabrics for quilters, craftspeople, and sewers. There are over 20,000 bolts to choose from. They stock lots of dress fabrics and carry a diverse selection of threads, patterns, pillow panels, foam and batting - pre-cut to the size of your quilts. Good's Store is a Walmart-like department store which carries a broad selection of household goods, clothing, toys, and hardware items. Noteworthy are the Amish and Mennonite fabrics, pattens, calicos, quilting frames, cross stitch kits, pillow panels and forms, stencils, paints and more. Although the interior of the store is not very charming, the prices are very low. Tucked away on a country road is one of Lancaster County's best-kept secrets. Awaiting your visit is a shop within a barn, brimming with accessories for both home and garden. Stroll around the 10-acre property and enjoy the views and the gardens. A diverse showplace for working Lancaster County artists and craftspeople. On sale is locally-made jewelry, pottery, furniture, art, contemporary and traditional quilts and other collectibles. Charming Amish shop focuses on dried flower arrangements, candles, local handcrafts, and painted furniture. Lancaster County publisher nationally acclaimed for some of the best books about the Amish and Mennonites. Subject matter includes cooking, quilting, family life, parenting, culture of the Pennsylvania Dutch communities, history of the region and so forth. Books range from fiction to biography to children's stories to humor. A wide display of high-quality Amish furniture including rocking chairs made from cherry, oak, and hickory wood and oak and cedar bedroom sets, as well as quaint birdhouses and unique mailboxes. This is also a great place to buy kid toys such as old-fashion red wagons and Amish scooters. Observe candles still being poured and dipped the "old fashioned way" by local Amish craftsmen. Shop for the latest in candles, potpourri, and candle accessories. There are hundreds of styles and scents to choose from. Amish furniture such as a table, chests, and desks are created by local Amish craftsmen. Ceramic creations ranging from functional pitchers, casseroles and mugs to imaginative vases and pots. The shop features the work of dozens of local potters and ceramic artists including Ned Foltz who is known for his traditional redware with his use painting with slip (colored, liquid clay, and sgraffito (scratching a slip-covered piece to expose the red clay underneath. by numerous fine potters. The shop also features the beautiful porcelain and stoneware creations of Judith Nafziger, a famous local Mennonite artist. This simple, country grocery store has the atmosphere of the 1940s. Conventional supplies are stocked as well as fresh produce and local favorites such as apple butter. Custom made plates created by the traditional art of Sgraffito. Sgraffito is the decorative scratching of designs on plates. Designs vary from birds to flowers. A distekfink, by the way, is the German bird of happiness believed to bring happiness to newlyweds. The plates make a traditional gift to honor weddings, births and other events. You may want to call ahead to see if you can see a plate being made. Established in 1770, Demuth's Tobacco Shop is the oldest tobacco shop in America. The shop has been passed down through the Demuth family for more than 200 years. 18th Century restored barn houses a retail store filled with home furnishings, hand-crafted lighting, unique folk-art and gifts. They specialize in authentic as well as restored period lanterns, lamps and chandeliers. Tours of the 18th Century millhouse are also available by reservation from October through December.